Any organisation with more than five employees requires a written health and safety policy. A health and safety policy is typically divided into three separate sections, a health and safety policy statement, responsibilities and the arrangements an organisation has put in place. 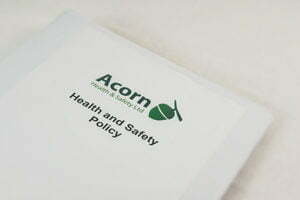 Acorn Health & Safety is a leading provider of health and safety consultancy in the South West. Our consultants come from a wide variety of professional backgrounds and have considerable, hands on practical experience which is reflected in our grounded, pragmatic approach. Customers come from an equally diverse range of organisations and businesses but choose Acorn because we’ll keep you on the right side of the law, whilst recognising that health and safety needs to compliment your day to day business activities. If required policy documentation can be supported by a bespoke suite of forms and templates including risk assessments, checklists and third party assessment tools. Should these be required many customers consider subscribing to ‘Hassle Free’ our retained consultancy service. How do we develop health and safety policies? In addition to legal duties a written health and safety policy that’s reviewed annually is a requirement of many insurers. A policy is also often a requirement for any business tendering for work, organisations seeking preferred supplier status or those applying for a variety of SSIP scheme accreditations. A qualified health and safety consultant will contact you and gain an understanding of roles and responsibilities within your organisation and the types of work undertaken. In most we’ll always try and meet face to face. There are a number of common elements to all policies such as risk assessment, training, communication, monitoring and review. Other content is very much determined by business activities, for example this might include working at height, use of display screen equipment, control of contractors or driving at work. From this we’ll create a bespoke policy and forward it to as a draft for initial comment and review. We will provide you with a final copy of your policy for you to sign, usually this will be a version controlled document provided as a PDF. We will assign you a dedicated and competent health and safety professional who will gain an understanding of your needs and be on hand to provide help and advice or comment you need.